A nice offer, wish I could go.. This has to hurt for people who have already bought them though. I remember buying a race change on wow, half a week later it is 50% off. 'twas a bit bitter. That's nice of y'all. 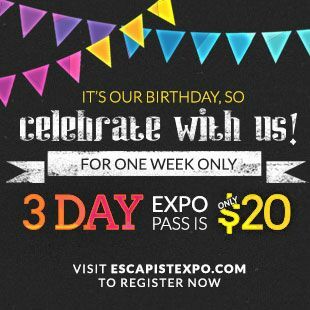 Happy Birthday Escapist, when the day comes. I wanna go so badly, but I don't think I can go this year either due to school, work, and having to pay the money I would use for a ticket and hotel to pay rent to my parents. That and my parents are leaving on a trip in October and I have to watch the house. I wanna go and meet some people so badly. Anyway, happy birthday Escapist, I've yet to break my addiction to you. Please, PLEASE come to the UK. At least once. But happy birthday anyway! Just please come to NYCC this year for realsies so that I can give y'all some awesome cookies. I think you missed Escapism UK. I'd go but plane tickets are expensive. By con standard, $20 for three days is a pretty good deal.